there is only war… | i r kiamsiap! finally. 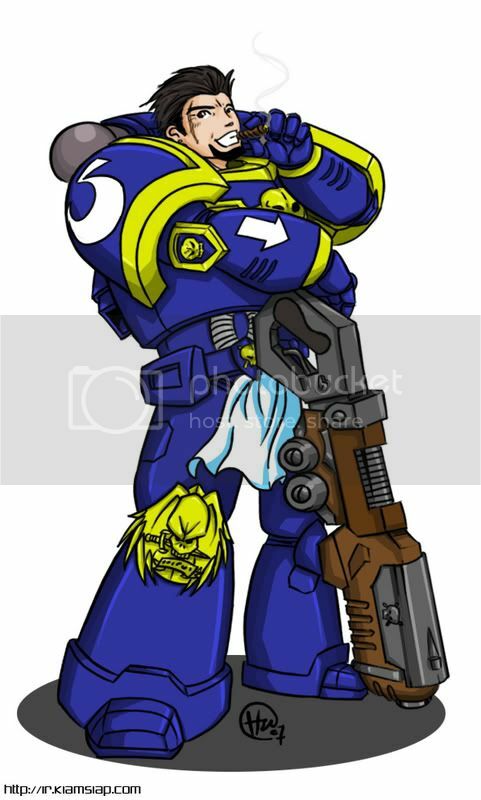 a spacemarine. tribute to the god emperor. The Adeptus Astartes.Â Heroes of the Imperium.Â Each one stronger than a hundred men.Â Gene-enhanced and trained to perfection. They are gods amongst men. If you’re not too busy, I’d like to take a moment to chat with you about some of the stuff you’ve drawn. So you don’t get phished and all sorts of ugly spam, send an e-mail to my address which you should have from the comment. yo dude…gambar mana? still WIP? you’re still not done with the thing?! how does he get out of that suit? what if he itched? what if he itched in his crotch? damn his collar looks huge… a bee could fly in…. now we wouldn’t want that would we. okok so my sense of art is a little distorted you get it…. LC: how does rotten BKT smell like? o_O? HY: thats an interesting question. probably jump around i guess.. haha..
the loincloth is a style thing. like wearing shades at night. totally useless, but is supposed to make you look cool. Uh…….what weapon is he holding? doesn’t look like a bolter to me ! termz: its a plasma type weapon. :b i got an accurate reference picture. only slightly modified without the cables running out to the back..
which makes me wonder… what will a champion of chaos look like then? the ultramarines may be stiff but they are the most recognized.